When you come home to a house smelling like this Honey Garlic Slow Cooker Chicken Recipe you’ll thank me! 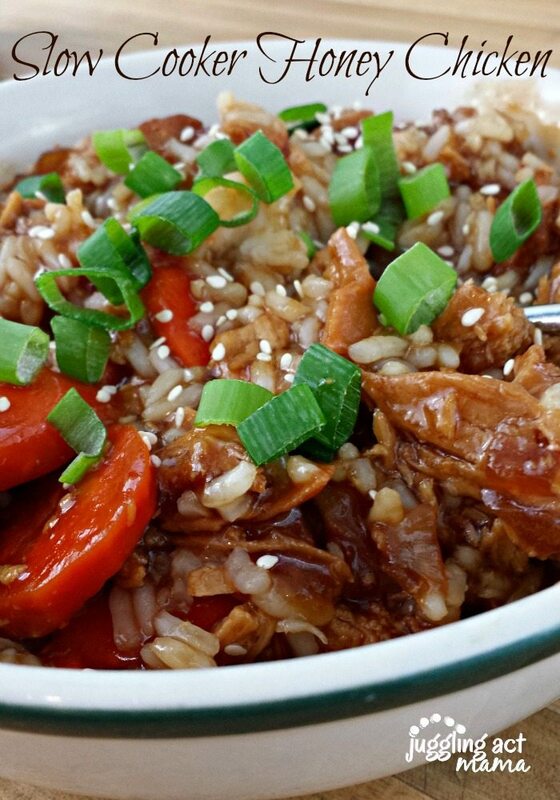 This Honey Garlic Slow Cooker Chicken Recipe has become a staple in our household. And why not? It’s easy, scrumptious and makes a great freezer meal, too! What a week it’s been with all the fabulous giveaways happening around here, huh? 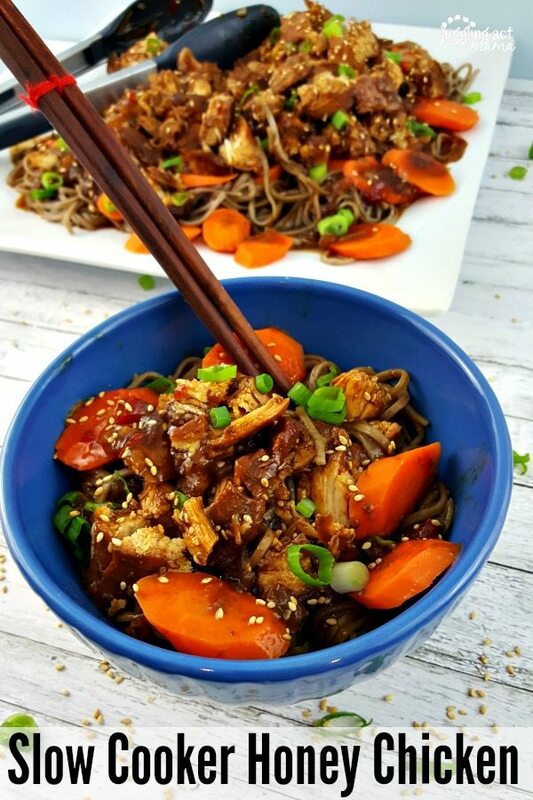 The fun isn’t stopping yet – today, I’ve got a fabulous Slow Cooker Honey Chicken Recipe & #SlowCookerMeals Giveaway for you! I can’t wait for you to check out this new recipe I cobbled together, and enter for a chance to win this amazing slow cooker! 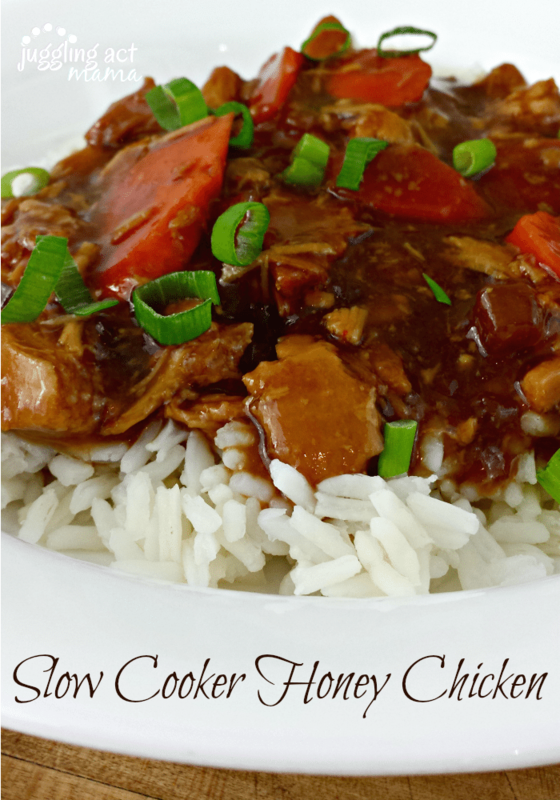 But before we get to that, I want to share with you my recipe for Honey Garlic Slow Cooker Chicken Recipe – this has become a new favorite in our house! We received the Hamilton Beach Set ‘n Forget® 6 Qt. Programmable Slow Cooker With Spoon/Lid to review and I wanted to try cooking something that I knew well to see how it compared to my old Crock Pot. 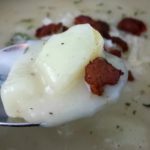 I made my Slow Cooker Potato Soup and was really happy with the way it turned out – maybe even better than normal! Being able to set the slow cooker on a timer means no more burned edges, which no one likes eating or cleaning! The slow cooker automatically changes it’s setting to WARM once the timer goes off – how cool is that? I was really excited to try a new dish in my new slow cooker! I did some research on honey chicken recipes, and ended up tweaking recipes from Table for Two and Damn Delicious. I might be kind of a snob, but as a rule I don’t care to cook with ketchup. I decided instead to use tomato paste and rice wine vinegar instead. I omitted the oil and added additional honey. Adding the carrots adds a nice color and brightness to the dish, too. I’m really pleased with the way this turned out. It’s got a little kick from the red pepper flakes, and a whole lot of sweetness that equals pure deliciousness! Whisk together the tomato paste, rice wine vinegar, honey, and soy sauce until smooth. Add in the diced vegetables and minced garlic. Add red pepper flakes, if desired. Season the chicken breasts with salt and pepper and add to the slow cooker. Set the slow cooker on low to cook for 5 hours. 30 minutes before serving, add the carrots and remove the chicken. Use two forks to pull it apart. Return to the slow cooker. In a small dish, make a slurry with cornstarch and water. This will thicken the sauce. Turn the heat up to high for 30 minutes. Serve over rice with a garnish of sesame seeds and scallions if desired. Note: You could add the carrots to the pot, but I find that they get too mushy for my taste. Give this recipe a try and let me know what you think – I’m betting it becomes a new family favorite just like at my house! Enter to win a Hamilton Beach Slow Cooker! Disclosure: I received the Set ‘n Forget® 6 Qt. Programmable Slow Cooker With Spoon/Lid from Hamilton Beach for purposes of reviewing, however, all opinions are my own. This giveaway is sponsored by Hamilton Beach, and I am a Brand Ambassador for Hamilton Beach. we are obsessed with the 8-can taco soup from @sixsistersstuff! My favorite slow cooker meal would either have to be a soup or roast with potatoes, carrots and onions. My fave thing to fix in the slow cooker is a white bean & chicken chili. Perfect for the colder weather! We’ll definitely try the honey chicken recipe – sounds amazing! Pot Roast with mashed potatoes! I love slow cooker recipes, especially as the cooler weather comes on. Thanks for sharing! I make this really good white bean crockpot chili. Stuffed pepper soup. So easy! My favorite is pinto beans with pork steaks(together in the slow cooker). I make the beans with fried potatoes & onions, turnip greens, and homemade biscuits. It’s the BEST country meal ever. My mom made it a lot when I was growing up except she used the stove for her beans. I take the easy route. Meals with that family connection are so amazing, aren’t they? Thanks for taking the time to leave a sweet comment. Good luck! Got to love a nice Fall pot roast and veg. Crock pot chicken chilli but as a side I looooove making apple sause!! My favorite slow cooker meal is north carolina pulled pork. We love chili in the crock pot on a cold day. 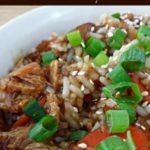 Jambalaya in the slow cooker is always a hit at my house! French Dip sandwich meat really great in our house. Always so tender and juicy. I like beef tips and mushrooms to serve over egg noodles. I love a simple chuck roast cooked for shredded beef. It’s so simple but yummy and versatile. 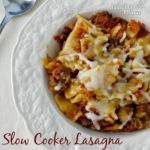 Slow Cooker Lasagna is my favorite slow cooker recipe! Beef Roast with carrots, potatoes and gravy on rice. I make a creamy chicken crock pot meal that the entire family loves! I like stew beef with gravy and vegetables. My favorite slow cooker meal is probably chicken tacos. They are so good and I can use them a few ways when we have some left over. Beef Stew is our favorite! I love pulled pork bbq! I love to make zuppa toscano soup in my crockpot. Soo good just like Olive Garden! My favorite slow cooker meal is beef stew,k it gets so tender and smells great all day while it is cooking, and is very easy.. I love to use my crockpot for baked potatoes. They’re delicious! I like to make chicken tacos in my crockpot. My favorite slow cooker meal is shredded beef that I then use for tacos. It is easy and flavorful. Nothing better than a good pot roast, with gravy, carrots and potatoes! I like to cook chicken fajitas in the crockpot. My latest fav is overnight apple oatmeal! Pot Roast with potatoes and carrots. Thanks for the giveaway! I love to make roast beef in the crock pot. My fave slow cooker meal is chicken breast with salsa, black beans, and corn. Thanks. Oriental Chicken and Peanut Clusters! We enjoy bbq meatballs and pulled pork for game days or cold weather. Steel cut oats done in the crock-pot is a staple breakfast in our house. I like Slow Cooker Chicken Stroganoff. I like pork roast for pulled pork sandwiches. My favorite slow cooker meal is one with chicken and stuffing. The chicken comes out so tender and moist! Love making a hamburger potato soup in my slow cooker. It is thick, loaded in cheese, and hamburger and cheese work together so good. Family loves it. Chicken, pork or beef… absolutely anything that can be served over rice or noodles!! My mom would always make a roast with gravy, and then we would make mashed potatoes, broccoli, and some type of bread in the oven to go with it. It’s a heavy meal, so it’s perfect for when you need a hearty dinner!! I like to make soups and stews in my crock pot, but my favorite is chili. Slow cooker vegetarian lasagna is my favorite. My favorite is Sunday pot roast with veggies and mash potatoes and gravy. My favorite meal in the crock pot is my pot roast. My family just loves it. Haven’t made anything in a slow cooker in a long time since mine broke a while back… but I did love making bean dip. I love to cook BBQ ribs in a slower cooker. I like to make vegetable rice. 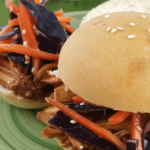 Pulled pork for sliders is my go to slow cooker meal! My favorite slow cooker meal is old fashioned pot roast. Recipe looks & Sounds great ! Thank you for sharing on Merry Monday! Hope to see ya next week!